Last year KnitPro kindly ran its first ever knit and crochet along in aid of Knit for Peace, called the KnitPro Designer-along. Working with a number of high profile designers and magazine editors 12 gorgeous blanket squares have been created for you to knit and crochet. They include: Debbie Bliss, Arne and Carlos, Erika Knight, Jane Crowfoot, Lena Fedotova, Debbie Abrahams, Simply Knitting, Simply Crochet, Crochet Now, Inside Crochet and Let’s Knit. The patterns are now available in an e-book with all the patterns plus ideas for blanket layouts using the squares and instructions for different borders. The e-book contains all the patterns plus the layouts and borders – buy now for £6.00 and you will receive a download link via email. 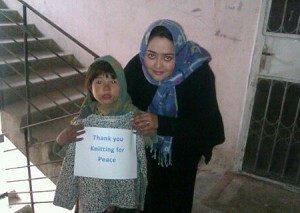 We send knitting to those in need in the UK and overseas.